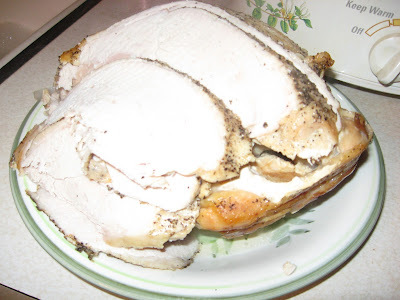 If you really don’t need a whole turkey for the holidays, or don’t like dark meat, or just want to streamline the holiday meal, then try a turkey breast in the crock pot. 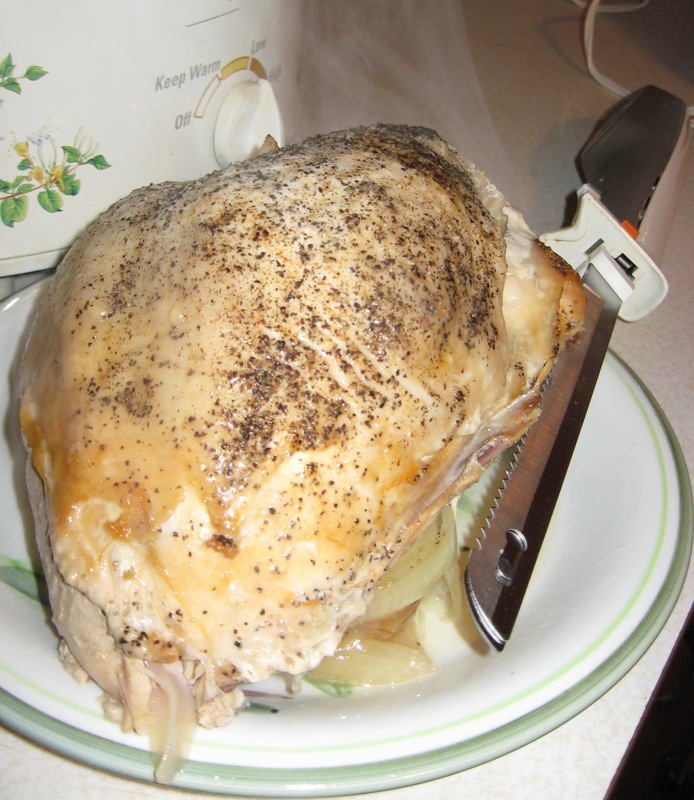 It’s much easier to slow cook the turkey, and the meat comes out moist and juicy. The first time I tried the crock pot method was an act of desperation, but it was such a hit that I often buy a turkey breast and cook one in the crock pot for everyday dining. A couple of years back, the newspaper schedule at the college was a mess with the paper going to the printer the day after Thanksgiving. Live and learn on that one. In any case, I ended up spending Thanksgiving day doing lay out which definitely limited the cooking. That’s when I decided to go with a turkey breast in the crock pot. The first thing I’d tell you is that the standard size crock pot probably isn’t big enough to hold a turkey breast (to start with anyway). As it cooks and softens up, you can mash the lid down (maybe with your foot) and get the top level to hold in the heat as intended. This is very frustrating, so check your size beforehand. I now have one of the large, oval crock pots which work great for turkey breasts. The one I bought is a divided dish crock pot. If I’m not making the turkey in the big crock pot, then I can do two sides at once using the dividers. The dividers come out for bigger items like a turkey breast. I really like my big crock pot. Small and medium turkey breasts fit well in crock pots. Some of the bigger ones don’t work. It’s not so much the volume as the shape. Think long and thin. Keep that in mind when picking out the breast. If you’re buying a frozen turkey breast, then it takes 4 days or so (in the refrigerator) for the bird breast to fully thaw. The full bird takes even longer. I think many a cook has discovered this from experience. In any case, do not buy your frozen turkey the day before cooking, or you will be dealing with a super cold hunk of meat. Another thing to remember about turkeys is that they put the special parts inside the bird. These are pieces like necks and livers. Yum. Some also include a pack of gravy in a plastic bag. You may think that you’ll not have to deal with extra packages with a breast, but my experience is that the companies bless you with spare parts no matter what part of the bird you buy (well – not the legs). Stick your hand in the big hole (which is the neck and not what you may think) and get the extras out before cooking. At the most basic, you really only need to stick the turkey breast in the crock pot with a cup or so of water and turn to low for 6 to 7 hours. • Put the breast in the crock pot. • Add a can of broth. Chicken broth is fine if you don’t have turkey broth. • Add salt and pepper. A bay leaf is also good. • Other seasonings can be added. Lemon pepper is one of our favorites. • Chunks of celery add a little flavor. • Potatoes and carrots can also be added. Put those in under the breast if you want a full meal in one pot. • Cook on low for 6 to 7 hours. • Take breast out of crock pot when done. Heat oven to broil. Stick bird under heat for a few minutes to crisp up and brown the skin. Some people (southerners) like crisped skin and fat, but the browning is mostly for appearances. Crock Pot Turkey Breast is really easy. It also means that the oven is not full of bird when you’re trying to make other items for the holiday meal. If you’re set on having a traditional turkey for the holidays, then consider making a breast in the crock pot for a family meal or to slice for sandwiches during the week. I think you'll be sold.